Date palm is one of the oldest cultivated plants, grown in the arid and semiarid regions of the world. The date fruit serves as a vital worldwide component of the human diet and a staple food for millions of people. Unfortunately, various abiotic and biotic stresses along with agronomic constraints are hindering date productivity. Those date cultivars adapted to stress conditions have low fruit production. Conventional breeding, depending on crosses and backcrosses, is a time-consuming process. The applied research carried out on date palm is limited, still there is enormous potential to improve date palm breeding methods. Advanced biotechnology creates unparalleled opportunities to develop new varieties with quality fruit, increased fruit yield and resistance to pests and pathogens. It also minimizes the application of potentially-harmful fungicides and pesticides and increases crop productivity. This chapter provides current and innovative information about date palm progress in terms of distribution, production, marketing strategy, current achievements, limitations and challenges facing date palm breeding. It also focuses on recent advances in tissue culture, genetic transformation and molecular breeding to improve the productivity and quality of the date. Research institutes concerned with date palm. Genetic resources of date palm. 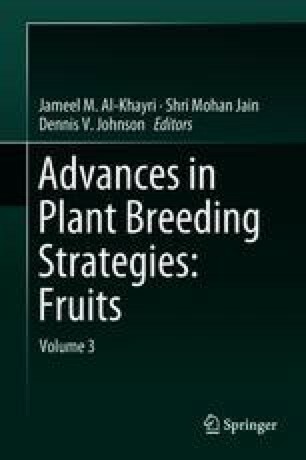 This information is available in the 2-volume book Date Palm Genetic Resources and Utilization (Al-Khayri et al. 2015a, b).